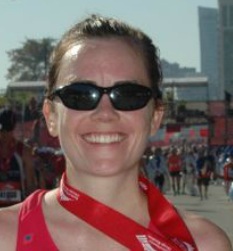 Yesterday I ran the Boston Marathon. It was not the day I, or anyone else, had hoped for. It started with a disappointing race. The details are meaningless now; I had hoped for a five minute PR, but struggled with cramps and a cranky hip just after halfway, and I barely managed a PR at all. I crossed the line in tears, and fell into my Fiancé’s arms, heartbroken. But then it got much, much worse. A few short hours later those tears seemed like the silliest thing ever. And my heart would break many more times over before the day would end. When we left lunch, my family and I tried to board the T near the finish line. It was closed; no one knew why. There were rumors of some threat on the T, and we saw police car after police car drive by. Firetrucks came too, but no ambulances, so I was comforted that perhaps no one was hurt. As we walked up the street to another T station, my sister sent a desperate text: “Please let me know you are alright, heard there was an explosion.” Then the ambulances started coming. I got an email news alert simultaneously, and when I read the headline, I crumbled to the sidewalk in a fresh set of tears. Explosions at the finish line—no one knew why/how many hurt/what to do. Fortunately I was able to get a few texts through to my sister and brother who got the news out to family and friends that we were okay. My teammates started an email chain, and quickly almost everyone responded. One teammate, unable to get through as the cell phone towers went out, wouldn’t be heard from for a few anxious hours. We were comforted knowing she had finished long before, and had no reason to be near the finish anymore. We kept walking, trying to figure out a way out of the city, and the news kept getting worse. As we tried to hail cabs, we found out people had died. More tears were flowing, real tears for people’s lives and limbs lost, lives forever changed. We couldn’t make it to my parent’s car to get our bags, so we left them behind and headed to the airport. At the airport, we saw the footage for the first time. I struggled to watch it. I could not, and still cannot, believe what happened. I feel ridiculous for having cried over some silly time in a silly race. The events of yesterday quickly put that in perspective. Life, family, and friends are so much more important. Who cares about a running race? But that’s what makes me so angry. This race, this event, is not offensive to anyone. It is a celebration of hard work, of hope through adversity, of triumph over diseases and tragedies just like this one. Spectators line the entire 26.2 mile course, standing for hours, cheering for strangers. There is no ill will; from the starting corral to the finish line, everyone is bonded together as they run, as if they have been friends forever. I don’t think there is a friendier environment anywhere. Why would someone ruin that? The runners yesterday are people who have spent years trying to qualify, who have worked hard to become better athletes for a chance to compete at Boston. Other runners raise millions for charities—supporting cancer research, veterans, and victims of Newtown. The spectators yesterday are those people that stand by their sides, giving these runners the encouragement to keep going, to keep up the training, and to keep fighting through the whole grueling race to the finish line. The fact that an event like this, a celebration like this, would be targeted is unreal. The fact that the spectators—our constant support team—took the brunt of it is not right. A day later and safe at home, I am in shock this happened. In the airport, we met others who shared the story of where they had been and how fate had saved them. Two parents talked about their daughter, how she was set to run but an injury prevented her from being on the starting line. Instead they watched from near the finish line. 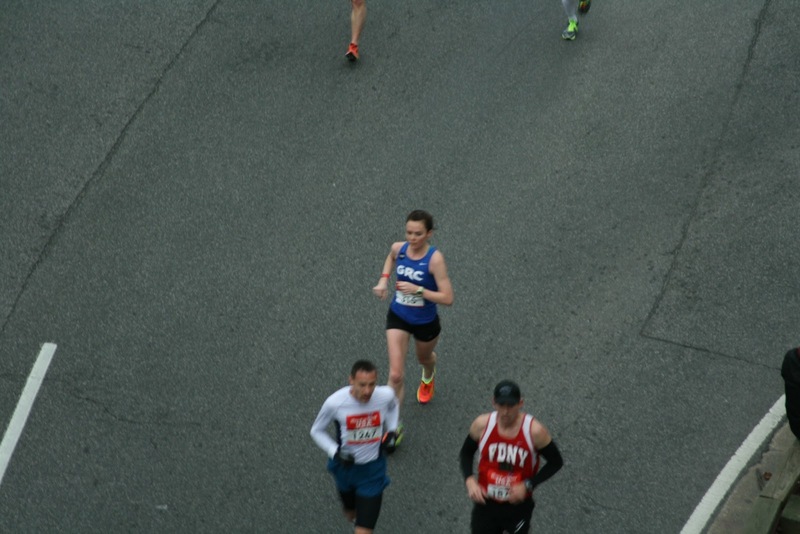 They left before the explosions, but the daughter said she would never run a marathon again, not after this. I’ll admit, I was thinking the same thing—even before the day changed forever. I was selfishly moping, thinking I had spent a year working hard to improve my marathon time and had only come away with only 30 seconds. I was thinking how hard the race was, and how I didn’t know how I’d be able to do another one, faster. I was thinking the same thing many marathoners think at the end of the race, how that will be the last one. Time, healed legs, and encouraging supporters will eventually change our minds, but that’s the important thing: we will get to make that decision ourselves, in our own time. No terrorist should be able to take that away from us. We cannot live in fear. We will band together, as runners always do on our way to a far off finish line, and we will pick ourselves up and get through this together. We can’t let these terrorists get what they want—to ruin our celebrations or crush our spirits. I am moved by the generosity already exhibited. The influx of donations crashed the Red Cross’s websites, their blood banks are full, donations are being offered from around the country in the form of food, coffee, places to stay. The running community has always been a supportive one, and it will continue to support us all, even when a tragedy crumbles us. Just a graph today. Good luck to everyone in Beantown or wherever you may be racing! We all know about carbo-loading. A couple days before the marathon, we suppress our tapering woes with heaps of carbohydrate goodness. There’s a lot of research behind it and so inevitably the Italian restaurants on marathon weekend are teeming with runners. But what about a few days before the carb-fest begins? I’ve heard that the week before is a good time to make sure you’re eating healthy fats. What’s the logic behind this? The idea is to get the body to oxidize (i.e. break down and use for energy) fat more than glycogen (that precious molecule we so carefully try to stock up and save). This can be achieved to some extent with training; the more we train to become endurance athletes the more we teach our bodies to use fat. But can we help out by eating a high fat diet? There’s a lot of research into this idea; the problem is not all the studies agree. Some use long periods of fat-loading (seven weeks! ), some only a few days. Some use different percentages of calories from fat, some look at endurance, others at speed... it’s hard to know what to think. I looked up the article that’s often cited for the recommendations I’ve heard. In this study, the researchers had well-trained cyclists eat 10 days of a high fat diet (>65% of calories from fat, see below for an example day), followed by 3 days of typical carbo-loading (>65% calories from carbohydrates). 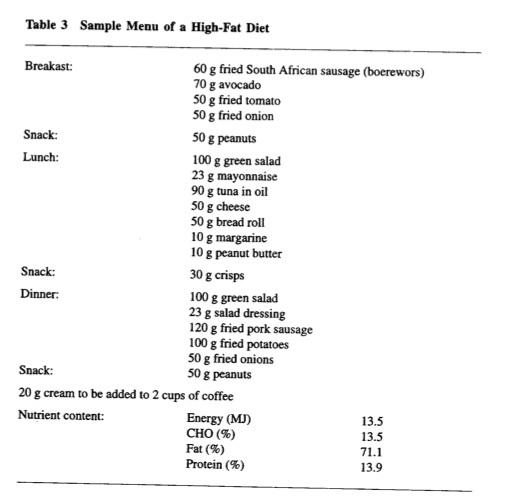 They compared this to a separate trial where the same subjects ate their normal diet followed by 3 carbohydrate filled days. They had the subjects bike for 150 minutes before completing a 20 km time trial. The high fat diet increased fat oxidation and decreased oxidation of muscle glycogen, as the researchers hoped. Moreover, when the cyclists had eaten the high fat diet, their times for the time trial were slightly (but significantly!) faster. So this study suggests 10 days of high fat diet followed by the typical carbo-load helps improve performance. The inclusion of the carbo-load is important; studies that don’t include it often don’t see any benefit from the high fat diet. It seems like without the carb-fest, the fat-fest won’t work. You always need to eat that pasta. One thing that jumped out at me was that they also gave the subjects easily digestible fat solutions just before the time trial and a combination of digestible fat and carbohydrates during the trial. I picture a fatty version of GU. The authors say this was done to maximize potential fat and carbohydrate oxidation during exercise, but they don’t have any controls to see if this is necessary to reap the benefits of the high fat diet. I've never eaten any fat during a race, so I wonder the real world relevance of this. I’m fine with eating some healthy fats (bring on the guacamole! ), but I don’t know about 65% of my diet from fat. That seems like a lot of fat at a very delicate time in the lead up the marathon. It’s certainly an interesting idea, and I’ll keep a look out for more studies. 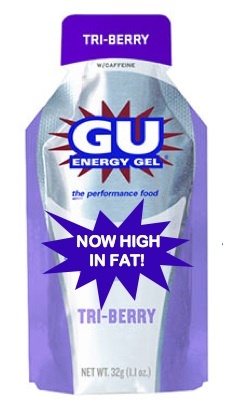 In the meantime, has anyone tried this drastic of a pre-race diet? So it turned out the weather was pretty perfect. Nothing to hold me back from a great race now. We had some trouble finding our way around the start, and arrived on the line without much time to spare. That meant not much time to get nervous, which was perfect. The first mile was smooth, I hit 6:15 on the nail. The next couple of miles I just tried to keep my rhythm and was pretty close to dead on. I remember at one point thinking about how awful I had felt in the last half I ran, and how this was completely different. This was my day. We started up Rock Creek Parkway and a couple miles were a tad fast, but I knew the Big Hill was looming. I also realized my teammate J was close behind me (I could hear the cheers for her.) She had originally planned for a bit slower; I knew she must be feeling good and en route to a great day herself. Two big PRs, here we come. Shot from above-- taken from a bridge over Rock Creek Parkway. The Hill in the USA Half (a slightly different course than year’s past) is also a hill I run often in my training (I live close by, so it’s unavoidable) and it’s a Beast. In the weeks leading up the race, while slowly shuffling up it, I would wonder how the heck I’m going to race up this thing. On the way up race day I actually felt alright, I just tried to keep an even effort even though I certainly had to be slowing. I passed the woman right in front of me halfway up and that gave me confidence—maybe my hill skills are back. At the top, I think I looked like death (friends said I looked pissed.) I was glad it was over, but I just wanted to get my legs back under me asap. But the next mile or so I was still going slow. (The split for the hill mile was incredibly slow—as expected.) The course is perhaps ever so slightly uphill at that point; I was just aching to get some downhill, gain some time back, and get back to nailing 6:15s. I remember really liking the rolling hills through miles 8-10 last year, so I looked forward to those. I got my rhythm back, passed another girl after another hill, and then managed a quick split for mile 10 (mostly downhill) but realized I was still ~20 seconds off pace for a sub 1:22. Between miles 10 and 11. There were two women not far ahead, and I used catching them as motivation to pick it up. 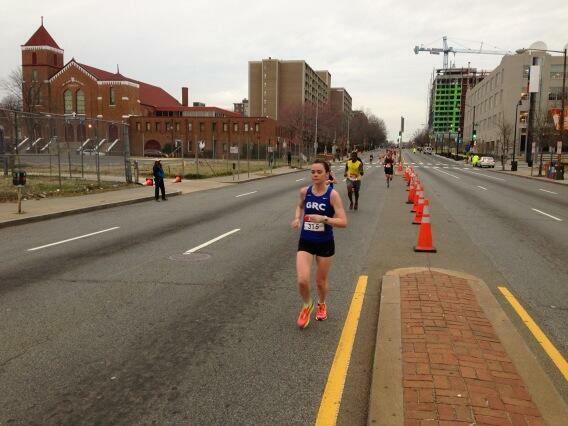 I somehow completely missed the split for mile 11 and at mile 12 was still 20 seconds slow. With only a little more than a mile left I had to move. I had passed the women, but now a man was running in front of me and every time I came close he took off sprinting. Well, I didn’t like that one bit, so I got a little mad and went after him. (More motivation!) J was close on our heels, speeding along to her own huge PR. I knew it would be achingly close to 1:22 and so I sprinted as hard as I could. I could see the clock and I knew I just barely had it. Afterwards I felt pretty good. I took a longish cool down and my legs felt fine. I was pleased with my 1:22, especially since I was pretty unsure that was possible a few weeks ago. I certainly have had loftier goals in the past (ugh, Philadelphia) and fallen flat on my face, but this time I did exactly what I set out to do. Using the same sketchy statistics I used above (comparing half marathon to full marathon times from past years) it seems like I’m in shape for a big PR in Boston. Now that the taper has started and the race is looming, the doubts and questions are trying to creep back in, but hopefully I can silence them on Patriot’s Day.